My obsession with Fig Newtons (small, squarish fig cookies for those of you not familiar) started in childhood; they were one of my dad’s favorite treats. And, being a fairly obese child, a cookie was cookie; bring it on! Luckily (unluckily?! 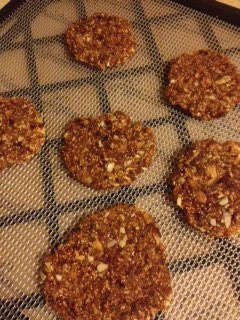 ), I loved the flavor and Fig Newton’s quickly became one of my favorite cookies, too. Fast forward a couple of decades, and I still love figs, and I still love Fig Newton’s (Newman’s makes an awesome version too! ), but I don’t love the preservatives, HFC, gluten, and whatever other nasties are floating around in a bag of Newtons. What to do, what to do…I know, make a healthier, vegan version of my childhood figgy treat! Enter, Skinny Figgy Bars ala Fat Free Vegan Kitchen (which can also be found in the awesome cookbook Vegan Holiday Kitchen by Nava Atlas), which I made a few (dozen) times last year. But that was last year. This is this year, and this year I’m eating a bit higher on the raw spectrum, so I went back to the drawing board food processor, and this is what I came up with. 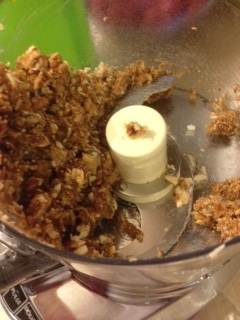 Place everything in a heavy-duty food processor and process until mixture begins to form a ball. Scoop giant tablespoons of mixture out of the food processor and roll into a ball. (Note: Mixture will be VERY sticky!) Then, you have a couple of options: either (a) place cookie balls on a dehydrator teflexx/paraflexx sheet, flatten, place on dehydrator tray, and dehydrate for one hour at 145F; then, reduce heat to around 110F and dehydrate another 2-4 hours or until desired firmness/tackiness; store cookies in the freezer or refrigerator, or (b) place cookie balls in a container and store in the freezer or refrigerator. Either option is delicious! I shared one of these cookies with a co-worker who can’t eat chocolate, so I make a special point to share chocolate-free goodies with her, and she said the cookies were the best treat I’ve never shared with her — and she’s even paid for some of my treats before! Sharing is caring…Slightly Indulgent Tuesdays, Allergy Free Wednesdays, Raw Food Thursdays, Vegan Friendly Fridays, and Wellness Weekends. I was waiting for these! Great idea. When I finally get my dehydrator – this will be one of the first things I make! Used to LOVE Fig Newtons! Thanks, Annie! They’re sooooo good! I agree, these DO look better than fig newtons. The best part was the filling. So these look amazing! 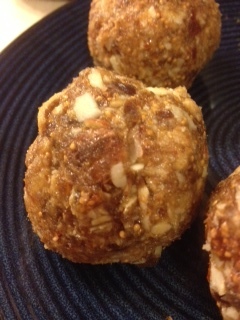 Thanks for sharing them at Raw Foods Thursdays! Those look wonderful! 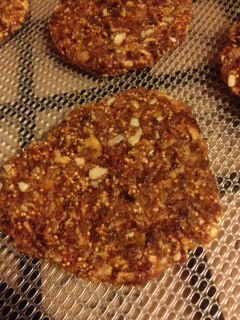 I haven’t tried making raw cookies in a dehydrator yet. Usually I just shape the raw cookie mixture into balls and eat them.